Well, it’s snowing again in Colorado. A lot. It’s mid-April and we have a foot or so of the white stuff on the ground. For the folks training for early season races, this is a big blow. You are mentally strained as it is packing in the volume and hard training. This is tough enough in nice weather never mind the bad weather. 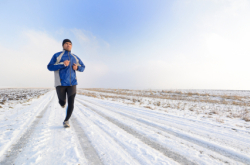 So what are you going to do when nasty weather derails your big training plans? Here are a few short and simple pieces of advice that will keep your head from exploding until the roads and trails thaw out. First and foremost, remember that it’s a privilege to be doing what you do. Worrying about what wheels to use and which type of intervals is trivial in the big picture. On Monday at the Boston Marathon two bombs went off, killing three and injuring nearly 100. One of the victims was an eight year old boy who was waiting for his father to finish the race. Many spectators and runners had limbs destroyed and will never be the same again. As focused athletes we often get tunnel vision, and no one has been more guilty of this than yours truly (particularly in the late 90’s). Yeah, training indoors can be boring and painful, but we are fortunate to be healthy, whole and able to train at all. So, enough. Head up. Onward. 2. Don’t Freak Out About Duration! If you try and ride 3+ hours on the trainer you are most likely going to lose it! I have talked about “endurance training” a lot. I cover the topic again in the TrainingPeaks webinar, “Methods and Tools for Training in the Winter”. If you go to about 20-30 minutes into the video, I start going over the the main theme that you can accomplish a lot with 90 minutes of work. When we add some higher intensity to that duration one can achieve a significant amount of endurance adaptation. In short, you don’t need to ride 3+ hours every weekend to achieve good endurance for your long races. Long rides are indeed key but remember that this snow isn’t going to last all summer and you have likely already done some long rides. So go back, look at your training log and take confidence in ALL your training over the last several months, and deal with the resources you have. 3. Make the Shorter Indoor Workout Count. Ok so you’re on the trainer and you realize that 90 minutes will do 90% of the job, but what are you going to do with the time? A while back I came up with a selection of Hour Of Power trainer sessions, which you can purchase and use on TrainingPeaks. If you do use these exercises, add a 15-minute warm up (or more for a longer workout) and a 15-minute cool down and you are set! These are workouts that are focused on VO2 endurance and strength. Twisted a bit, these are more fun and more engaging than your standard 4×10 minutes at threshold (BORING). Zone 2- for 5′. Ideal cadence. 4x 15″ Z6 (45″ recovery). Big gear on the 15″, in the saddle. Z2-3 for 8′. Climbing cadence, 5-10 rpms lower than ideal. 4×20″ Z6 (40″ recovery). Big gear on the 20″ in the saddle. 10′ Z3-upper Z3. Climbing cadence. Spend half the time standing. In and out of the saddle as you like. Hold the watts! 4×30″ Z5 (30″ recovery), high cadence. 3′ Z4 (or all out if you can’t hit Z4). Climbing cadence 70-ish rpm (lower than normal). 2×15″ max effort in a large gear, 45″ recovery. Take some time to cool down. So, rather than worry about the fact that winter won’t loosen its grip and you can’t ride outside, why not pick a workout from the library and watch the training webinar while you ride too? That’s some multi-tasking right there.